» Entertainment » Will Santa Claus get Christmas right ? Will Santa Claus get Christmas right ? 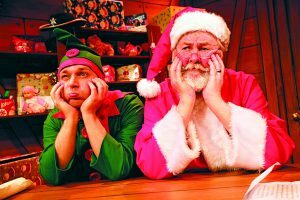 THE main man of Christmas – Mr Claus himself – will be heading to Woking’s Rhoda McGaw Theatre next week to appear in a stage version of the book, Dear Santa. Written by Rod Campbell, the author of children’s book Dear Zoo, Dear Santa is packed with Christmas songs and lots of audience participation. There’s also the chance to meet and receive a Christmas gift from Santa himself. It’s the story of Santa’s determination to deliver a fantastic Christmas present to Sarah. But things don’t go well, and he doesn’t get it right straight away. With the help of his cheeky Elf, he finally settles on something “perfect”, just in time for Christmas Eve. Aimed at children aged two to seven, the production runs from Wednesday 5 December until Christmas Eve, Monday 24 December.